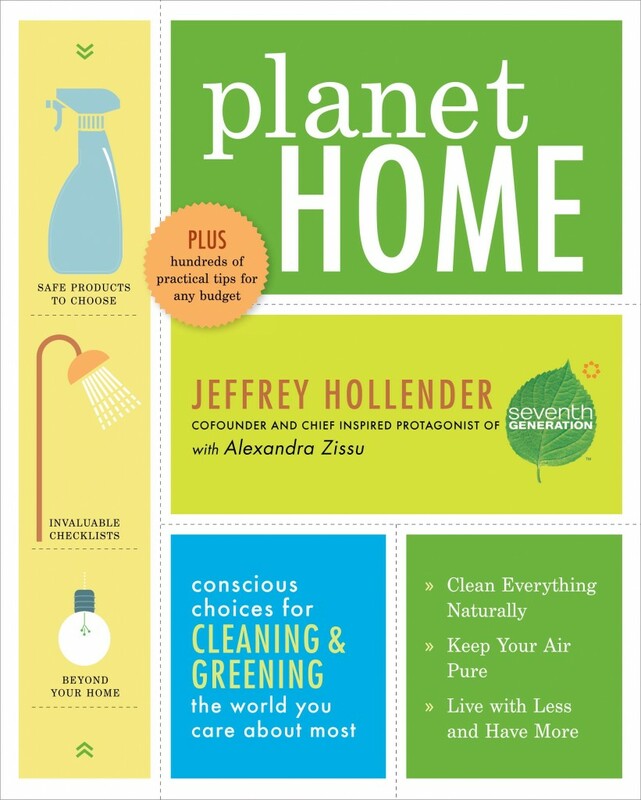 Planet Home : Conscious Choices for Cleaning and Greening the World You Care About Most is a useful book and a new release by Potter books, a division of The Crown Publishing Group. It is also quite the obnoxious book in my opinion. Using words like "visualizing", "imagine" and phrases like "embracing our right to happiness" really make me roll. my. eyes. Obviously, I have a completely different world view than the author of this book. But I still liked it. How's that? I have said it before and I will say it again, I do believe that we have a duty and a responsibility to take dominion over the earth and to care for that which is under our control and is our responsibility. Making good choices about the materials we use, taking care of our family's health by being aware of certain chemicals and their links to various diseases just makes for good common sense. As a Christian, I feel that I should have a heightened awareness of how I care for my home and for my family. Therefore I do think reading information about "cleaning and greening the world you care about most" is important. Therefore I think that reading or browsing this book can be very helpful and useful. I just can't take the introduction and call to focus on "indigenous and Eastern culture [whose] cultures [are] based on spirituality" is in my best interest in "understanding the interconnectedness of who we are and what we do" very seriously. Once I got past the introduction though, I found Planet Home to be fairly practical and much more straight forward. The ultimate goal of this book, written by Jeffrey Hollender (of Seventh Generation fame), is to help the reader to see that while making good/green choices for the family is fraught with good intentions, it is better not just to understand that buying organic milk is not just best for you, but best for the cow as well. Again, the author really wants you to visualize the entire planet when making your choices and not just your grocery bill. Yet, I think that most of us are inclined to look at our grocery bill and the state of our family's health and I personally am of the opinion that that is a fine place to start. (If the government would like to decrease my taxes I might be more inclined to make more green choices in more areas. We are, however, forced to pick and choose.) 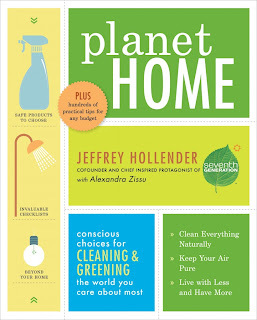 In our picking and our choosing, I think Planet Home comes in handy. Hollender divides his chapters up by rooms in the home, helping the reader to understand the cleaners that they use, how to eat consciously, what the term "USDA organic" really means, etc., etc. I particularly like that he divides his list of produce up into two categories - foods that you should always buy organic and produce that is lowest in pesticide residue. Those are the kinds of things that I want to know about and I find useful tips in caring for my family (again, my primary source of responsibility.) He talks about everything from bedding materials, to night lights to the hot-topic-if-you-are-having-a-baby cloth vs. disposable diaper arguments. Basically he walks the reader through their American-ized home and causes them to pause and consider the materials in their home and the effects that such materials can have not only on the environment but on the family's health. Now, you can certainly expect that this book is a little extreme. Again, he is really wanting the reader to think holistically. He wants his reader to stop compartmentalizing how they choose to "go green." I can appreciate that, even if I do not agree with his presuppositions, terms and worldview. But I do think he offers useful information for the reader to consider as they make choices that will best benefit that which they have personal responsibility over. I also think that you do have to sort through just about any "green" book and do some gleaning. So I'm not taken aback by the idea that I would have to do the same with this particular title. I would hastily point out that what might work to "green" one family might not work for another. We all have to pick and choose and make the best decisions possible. If you are pondering such decisions, this book is very interesting. I am therefore happy to say that The Crown Publishing Group has offered one copy to giveaway to one of my readers here at Reading to Know. Would you like to win a copy of this book? Simply leave a comment below. This contest is open to U.S. Residents only and will be open through Tuesday, February 22nd. THIS CONTEST IS NOW CLOSED. THE WINNER (as selected by random.org) IS #2 - ANNETTE W.
Thank you, Crown Publishing, for sending a copy of this book for me to read and "chew on." And thank you for generously offering one of my readers the chance to do so as well. I really appreciate your honest review of this book. That said I am intrigued by it and always looking for ways to go greener, I like the idea of getting the whole picture and then figuring out what works for me. I'd like to win this book, it sounds interesting! I have never read a "green" book, but when reading magazines, am often intrigued by statements...knowing some are right on while others are, um, overly exaggerated. Your honest review is appreciated...the book has plenty to offer, but like you, I suspect much is to pick and choose. I've heard raisins are one food that should always be organic. Will be trying that the next grocery trip...though I almost never buy organic. I'm willing to be educated though. We consider ourselves to be "green," but in a realistic sort of way. We pick and choose our issues. Please enter me. My husband and I would both like to check this one out. I've recently been trying to "green up" our lives a bit, even though it's mostly from a financial standpoint. Many times going green is extremely thrifty, but then sometimes not so much. I usually skip the expensive changes. :) So, I'm sure there would be a lot of picking and choosing for me, too. I'm pretty green or atleast I think I am :) My hubby calls me a treehugger and a veg head (vegetarian). We don't use chemicals in this house either. I like the way you addressed the "world view" perspective. Even though I think there is going a bit too far in the "green" world, I also believe as a Christian I should be a good steward of the resources God has entrusted to me. This book sounds like a good read. Sweet! Yes, please! I'm all about learning as much as I can about the chemicals we come in contact with and making my home a better place for my family! I am always interested in another perspective on this issue. I would love to read the book. Years ago, I purchased a book called Clean House, Clean Plant by Karen Logan. It is full of recipes for cleaners to use around the house. I use it every day in my home. I'd love a copy of Plant Home. thanks! I'd be interested in gleaning from this book as well. Thanks for the review! Sounds like a good, informative read! You wrote a great review of this book. I am a Christian-conservative-environmentalist, so I think that stewardship of the earth and our bodies is very important, but I think our reasons for caring about green issues has to be God-focused and not self-focused. This book looks like it has some handy info in it. Would love to win a copy! Ha, those phrases would make my eyes roll, too! That said, I'd be very interested in winning this book! (I looked...my library doesn't carry it.) I've begun to make better choices for my own health and the health of others, but I've still got a long way to go.